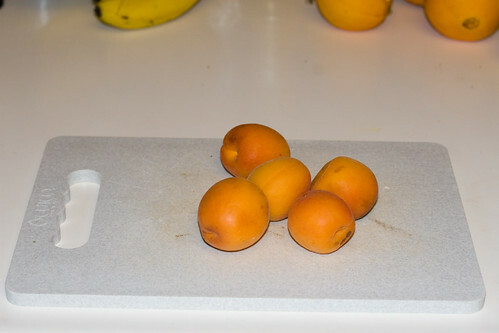 About a month ago, I picked up some slightly tart, first of the season apricots. This was one of my quick Wednesday market missions, and I regret to admit that I’ve forgotten from which vendor I purchased them. Apricots have always been one of my favorite fruits. My family used to make two road trips every summer—one north and one south—and we would often stop at farm stands to buy fresh fruit. Apricots and Santa Rosa plums were my weaknesses on these stops, and I’m fairly certain my mother had to meter my consumption, at times, to prevent me from getting sick. Apricot was and still is my favorite jam flavor, and dried apricots are probably my favorite dried fruit. The orange glow of their flesh is even reflected in a significant portion of my wardrobe, as well as the color accents on this site. The weekend after I got these apricots, we hosted a friend for burgers—with beef from the same cow as the ribeye—and I wanted to make a little appetizer for us to enjoy while the grill heated up, and decided on baked apricots with Manchego and pancetta, drawn to the pork and apricot interplay that later worked so well in my pork belly. 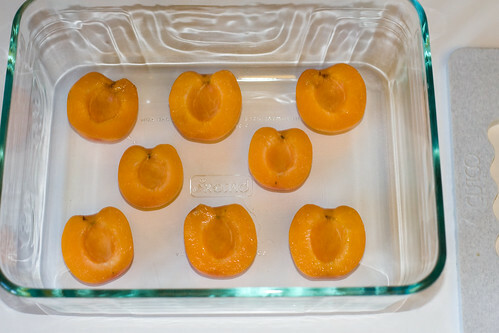 I halved the apricots and removed the pits, then arranged them in a baking dish, cut side up. 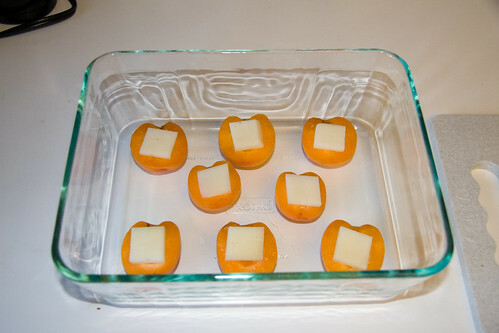 I sliced small squares of Manchego, a firm, nutty Spanish sheep cheese that goes marvelously with cured meat, and placed one on top of each apricot. Finally, I cut thick slices of the same Bledsoe pancetta I used in the Roman style fava beans and placed them on top of the Manchego. 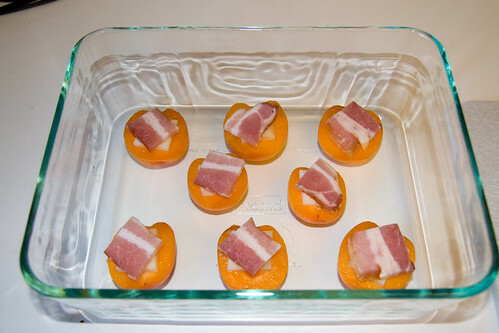 I baked the apricots at 350° F for 45 minutes, until the cheese had browned slightly and the pancetta was slightly crispy. The apricots were a bit soft and messy, but the combination of smokey and salty pork, nutty, creamy cheese and tart apricot was simply delicious. 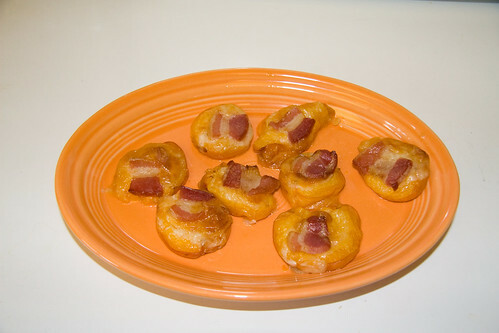 In the future, I might try to cook these in a muffin pan with a little savory pastry to hold the bottom all together.